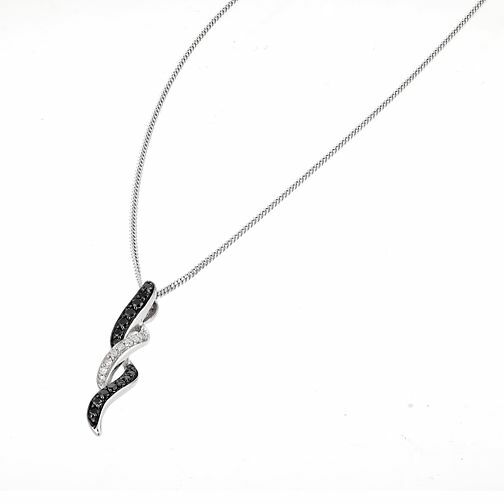 From our exclusive Vivid diamond jewellery collection, this stunning 9ct white gold pendant features treated black and white diamonds in a fluid crossover design. The perfect pendant for day or night. 9ct white gold white & treated black diamond pendant is rated 4.0 out of 5 by 2. Rated 3 out of 5 by Anonymous from Necklace lived up to the picture on the website The necklace was good value for money however I paid extra for gift wrapping which did not live up to the picture on the website. I would rather have paid more for the wrapping to live up to the internet picture especially as this wa a gift for my sisters 50th.